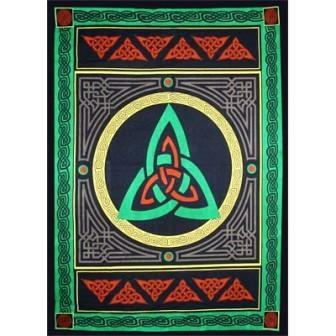 This magnificent tapestry features a green and red Triquetra encircled by a golden ring of Celtic Knots and elaborate borders of eternity knots. The Triquetra symbolizes the union of three equals, which are interwoven for all eternity. Each beautiful tapestry is meticulously hand crafted from 100% cotton. Tapestries can be hung on the wall, used as tablecloth, blanket, curtain, or as a focal point for meditation. This tapestry measures approximately 52" x 76". The Celtic Triquetra is the symbol of the Holy Trinity (Father, son, Holy spirit).